Vladimir is the best place to see how Russia has changed over the ages. While the city has three UNESCO World Heritage Sites, Soviet apartments and industrial sites line its outskirts. Prince Vladimir Monomach founded Vladimir in 1108 as a defensive outpost. Over a century and half past before Monomach’s grandson, Prince Andrei Bogolyubsky, tried to unite the principalities of Kyivan Rus—the precursor to the modern Russian state—by moving the capital from Kyiv to Vladimir. 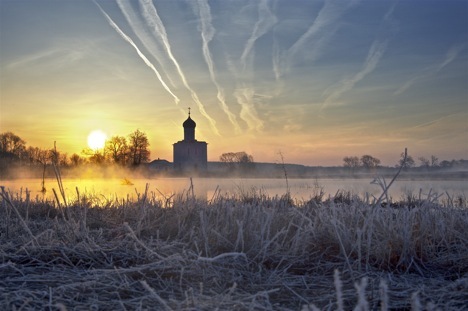 In the 12th century, architects from all over Europe arrived to build Vladimir’s churches and monuments. Vladimir’s heyday didn’t last long. In 1237, Mongol hordes led by Genghis Khan’s grandson, Jochi, stormed across Asia and laid siege to eastern Russia. The Mongols sacked Ryazan and Moscow. In the winter of 1238, they built a mound of earth to get over the wall surrounding Vladimir and left left no survivors. Although the Russian capital moved to Moscow in the 14th century, Vladimir played an important role throughout Russia’s history. Today it’s one of the main stops on the Golden Ring, a rough circle of Russia’s most beautiful cities. Vladimir sits on a steep embankment above the Klyazma River and the city center is just a short walk uphill from the train station. Whether you’re taking the Trans-Siberian Railroad from Moscow to Vladivostok, or looking for a city to base out of as you explore the Golden Ring, Vladimir is an exciting first stop. Start your morning at Kofeinya na Chekhova (Ul. Chekhova 2), a relaxed coffee shop on the corner with Ul. Bolshaya Moskovskaya, downtown Vladimir’s main drag. Breakfast $7-10. Before lunch, stop at the Cathedral of St. Demetrius (open 11AM-5PM, Ul. Bolshaya Moskovskaya 60 ). One of the famous ‘white stone churches’ that helped Vladimir garner UNESCO status, this cathedral was built in 1197 by the order of Prince Vsevolod III and features a breathtaking exterior of over 1,000 carved images. For lunch try Shashlychnaya Van ( Ul. Bolshaya Moskovskaya 61-A), which serves the city’s best shashlik, grilled meat often cooked on a skewer like shish kebabs ($12-30). Go back to Cathedral Square after lunch to view the Assumption Cathedral (open 1PM-5PM), one of Russia’s most important churches. The princes of ancient Rus were once crowned here, and the Assumption Cathedral in Moscow’s Kremlin is based upon its design. Inside you’ll find frescoes painted in 1408 by Andrei Rublyov, often touted as Russia’s best medieval painter. From Cathedral Square, walk six blocks west up Bolshaya Moskovskaya to the Golden Gate. Built in the 12th century as the western entrance to Vladimir when a wall surrounded the city, the Golden Gate features a tall archway with a church on top. The Military Museum upstairs has an exhibit of the Mongol invasion in 1238. Near the Golden Gate, visit the Crystal, Lacquer Miniatures, and Embroidery Museum in the Trinity Church (Bolshaya Moskovskaya 2), a magnificent brick building constructed in 1916 with exhibits on the region’s crafts and a gift ship. Turn right down Ul. Kozlov Val, which runs along the eastern side of the Golden Gate, and you’ll soon see the city’s old Water Tower (Ul. Kozlov Val 14). End your walking tour by taking the stairs up this ornate brick building for views of Vladimir below. Try Traktir (Ul. Letneperevozinskaya 1a) south of the Golden Gate on the next street west of the Water Tower for dinner. This is one of the city’s most popular eateries, located in a fancy wooden building—imagine a dacha fit for a tsar. Bands play music on weekends. Reservations are recommended (+7 492 32 41 62, main dishes $8-15). At night, take in some classical music at the Taneyev Regional Concert Hall (Ul. Lenina 1). Continuing west on Bolshaya Moskovskaya, the street turns into Ul. Lenina. Or check out a performance at the Puppet Theater (Ul. Gagarina 7). It’s located left off Ul. Bolshaya Moskovskaya back towards the Assumption Cathedral. For drinks, Sobornaya Ploschad (Bolshaya Moskovskaya 39) is a rock and roll themed bar across from Cathedral Square. Keep the party going at Fresh 44 (Bolshaya Moskovskaya 44), a club just a few blocks up the street from Sobornaya Ploschad toward the Golden Gate. Vladimir is a great base for making day trips to the beautiful and much smaller Golden Ring towns of Bogolyubovo, Yuryev-Polsky, or Suzdal. The white stone architecture in Suzdal shares UNESCO status with the buildings in Vladimir. The travel agency at the Hotel Vladimir (Bolshaya Moskovskaya 74) can arrange tours to nearby Golden Ring towns (appx. $15 per person). Independent travelers should head to the bus station, right by the train station, where buses to Golden Ring towns leave regularly throughout the day.